One of the samples woven for the GCW Master Weaver certificate program, with photo of finished jacket. I am frequently asked about the difference between the two programs - Guild of Canadian Weavers and Olds College master weaving certificates. Essentially the GCW program is a self-directed testing program while the Olds College program has in person classes in order to teach the participants, not just test their knowledge. With GCW, there are four levels with set problems that each candidate must answer. 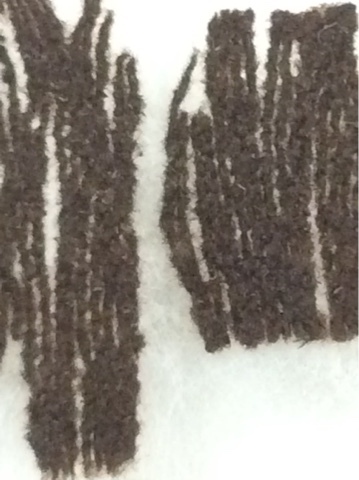 Most involve weaving samples and providing full documentation. 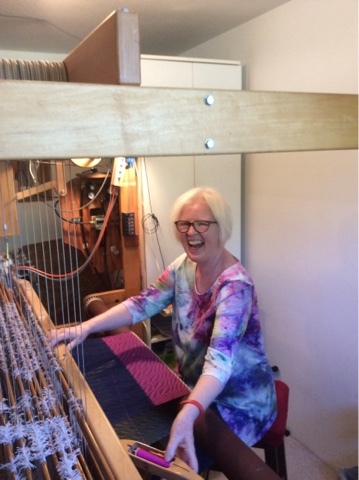 The final level has some problems which require woven cloth, some are paperwork only, and one involves weaving a traditional tapestry, along with the research project which again involves weaving samples and providing full documentation. 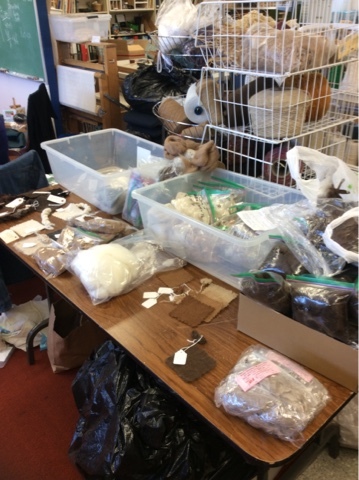 The Olds program requires the presence of the student at the 5 (or 6) day class for lectures and the weaving of samples, then there are homework assignments to be done in the following months at home which are then sent to the instructor to be marked. All components of the homework must be passed in order for the student to pass to the next level. 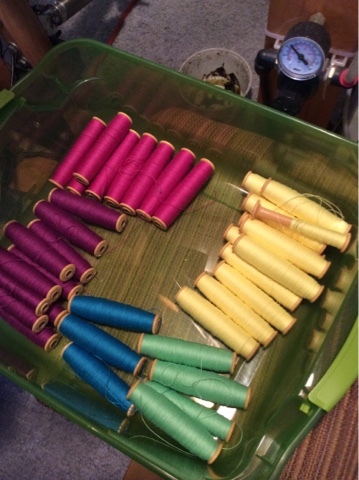 When I tackled the GCW program there were very few options for learning weaving in-depth. I could not afford to enroll in (another) college level two year certificate program - I'd already done that. However, I felt that there was still much more to learn and I set about digging further and deeper, approaching the craft in an analytical way to try to understand the principles. By the time I investigated all the options, I had determined that the GCW program would best suit my needs. I was very self-motivated so a self-directed program meant I could fit it into my schedule. I could do it at home, in my own studio. And I could really dig into the sampling required to make sure I could execute the test samples as well as I could. I had to become my own best/worst critic - by understanding the requirements, then setting the very highest standards for myself, I could accept - or reject - my own work and either submit or re-do, as seemed appropriate. Along the way I did a lot of pure sampling, comparing the results, analyzing them, adjusting things like density and weave structure and the wet finishing to see how changing one variable changed the end results. Gradually conclusions formed and I felt I was beginning to really understand the underlying principles. The Olds program is the first one that I have come across where those very underlying principles are actually taught to the students. The lectures present the principles and the foundation information, then the manual directs them through a series of woven samples to help them understand how those principles work in practice. The in-class weaving they do are the pre-sampling they need to do in order to go home and weave their samples to complete the homework assignments. When possible, I bring my samples done for the final research project of the GCW tests, partly as an example that I have already done the work that is being asked of them. That I am not telling them to do what I say rather than what I do, because I have already done that sort of experimental sampling myself. I hope to show them that I believe deeply in the concept of doing the work in order to fully understand the craft. That the class is not just to 'force' them to do things that are not meaningful, but that - if we are to truly grasp the essential nature of the construction of cloth - we must all do the work. Because change one thing, and everything can change. That the only correct (short) answer about weaving questions is - it depends. It depends on the yarn. It depends on the loom. It depends on the weaver. It depends on what, precisely, the weaver wishes to result from their efforts. And the only, only, way to know any of that...is to weave the samples. So yes, I am an ardent supporter of the Olds program. 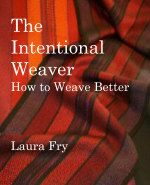 Yes, it may be a little more expensive than taking a workshop, but the depth of investigation goes much further than most workshops because the aim is to bring the weaver to the point where, instead of being told what to do, each weaver will begin to learn how to make those decisions for themselves. To give them the tools to make good decisions. 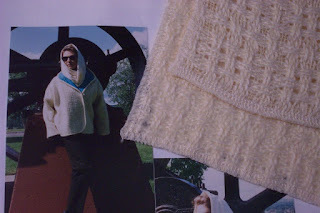 It is a serious commitment of time and energy, and even, yes, of the yarn to weave the samples. The program is also a 'for credit' college course, so participants ought to be prepared to invest the required time and energy, and money required for materials. Because they are not just taking a workshop. They will be getting an education. And yes, it is intense. Students feel like they are drinking from a fire hose along about the end of day two. But it is all important information, and all of the course content is there for a very real and specific reason. More satellite programs are being developed - in addition to the classes here in Prince George, BC and Yadkinville, NC, negotiations are underway to begin level one at the Gaelic College, St. Ann's, Nova Scotia, June 5-9, 2017. Me, peering at one of the fabric samples. Today was a 'free' day and Janet phoned a contact at the Fortress of Louiseberg, a national historic site. Nice to have a local with contacts! An appointment was made with the archeologist and we drove over to the site and got signed in. 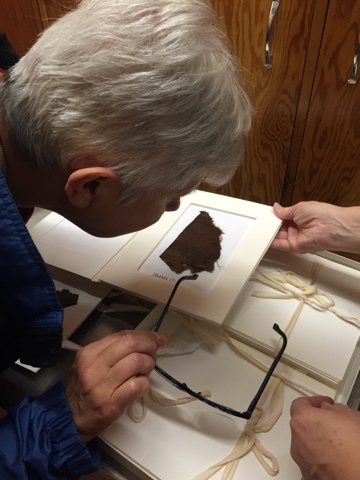 As we had no clearance, we had to have the archeologist with us in order to see the textile examples. 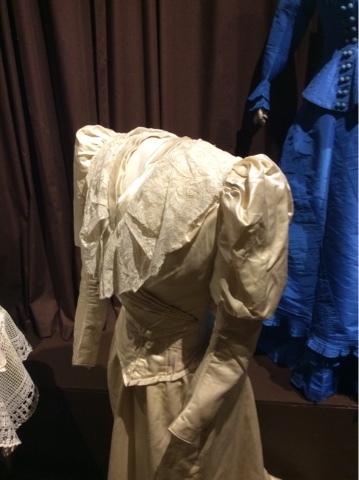 There are a variety of textiles, mostly knitted or woven, the weaving fairly simple - plain weave and twill. 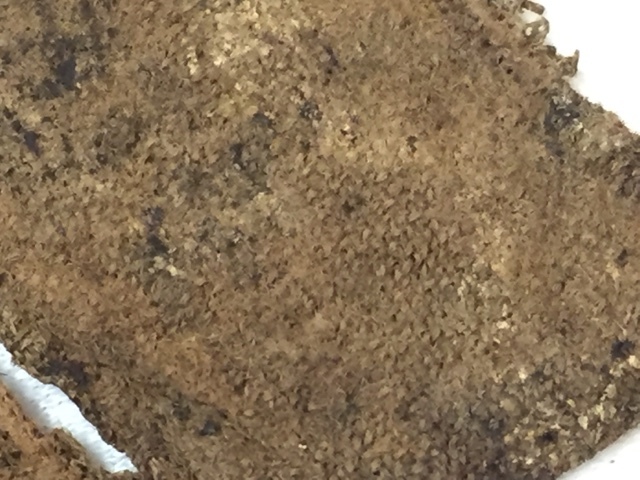 Some of the fragments are very likely heavily fulled after weaving, or just felted. Impossible to say with just a visual inspection. However! Researchers are allowed to examine more closely and we were given instructions on how to obtain clearance. 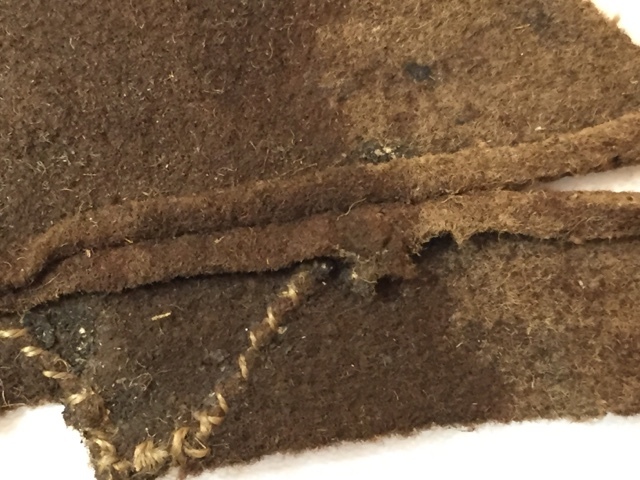 One of the samples I would especially like to see magnified looks like part of a vest with a buttonhole and very possibly an attached lining. 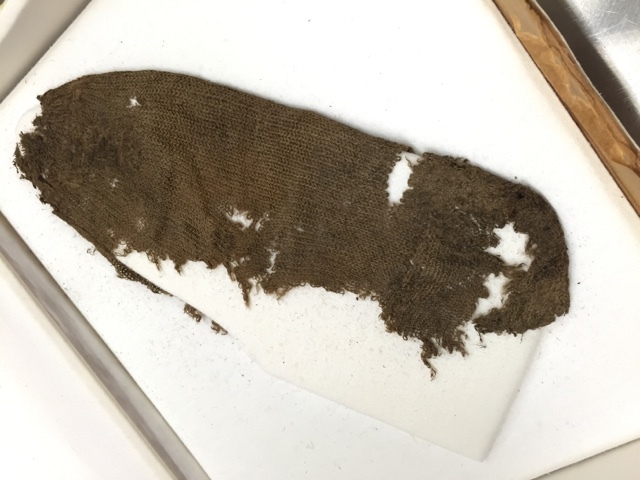 The face of the sample (as mounted) looked like plain weave, fairly heavily fulled, with a lining of a lighter weight cloth woven in twill. And both of them amazingly fine. The knitting, which was mostly stocking or sock fragments, was in incredibly fine yarns. And this sample of some 'loose' yarns...how did it survive? There is no evidence of a weft to hold them together...they are just there, side by side, all the same quality, probably a two ply wool. I am so hoping to get back next year and see if I can get clearance as a researcher so they will let me use the microscope and see them really closely. 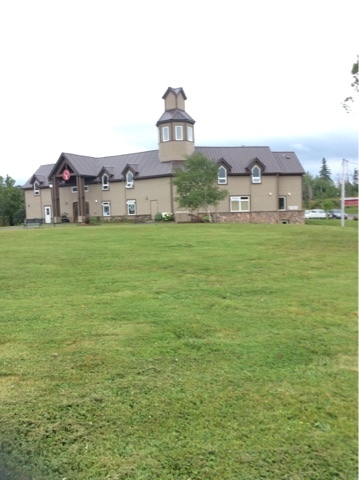 Gaelic College is located in lovely St. Ann's on the Cape Breton Island of Nova Scotia. They will be offering level one of the Olds College master weaving class from June 5-9, 2017. Meals are served in the on site cafeteria and they accommodate special dietary needs. So far the meals have been fresh and tasty. The studio is equipped with mostly Leclerc looms, so no need to bring one. The usual min-max required for the class is 8-12, so a small class. As soon as I know when and with whom to register, I will post the info here. thanks to Doug for taking the photo of the Holzworth ladies! When you are an 'independent contractor', you don't always get to choose dates that work 'best' for you. The group hiring you will set the date/time/place and you either agree...or don't. This year mom turns 90. It has been a couple of long years of various health issues, which seem mostly resolved - for now. But as it happens, my trip next week means I will be out of town for her actual birth day. I had thought to have a 'party' for her, inviting all the nieces/nephews who live in the area, but mom said large groups are too tiring. 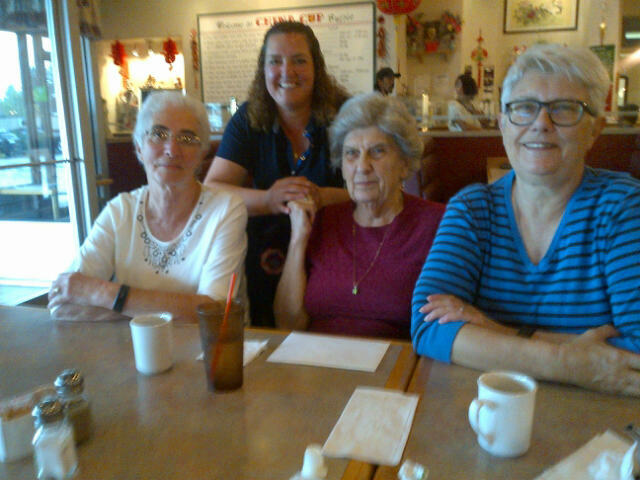 Instead we opted for lunch at a local Chinese restaurant and a niece and her daughter came. The small group meant that we could all talk to each other, get caught up since the last time we'd seen each other, and enjoy each other's company. Other nieces/nephews will be in touch with mom as convenient, so she should be able to visit with them in equally small-ish groups. The past week has been a bit hectic - seeing Mary off to the airport, several days at the fall fair, packing. The 6:30 am flight is looking even more challenging with the alarm being set for 4:30 and not arriving until about 11:30 pm - given the flights are all on time and I make my connections. Only two connections for this trip, and no border crossing involved, so hopefully everything will go smoothly. I made arrangements to arrive a couple of days early, to help get over the jet lag - only four hours, but it will mean my sleep cycle - never great to begin with (thank you menopause!) will be disrupted. I will just be getting used to the time change when I have another 6:30 am flight to head home. Oh, joy. Speaking of border crossings, I will be heading off to Tennessee mid-September during which time I will be taking a workshop with Bonnie Inouye and meeting with my book person, I hope. There are a few technical details I want to ask about before I go much further. I should start getting feedback from the alpha/beta readers (the manuscript is so raw at this point I hesitate to call them 'beta' readers!) when I get home from Cape Breton. In the meantime I have been managing a little progress on the conference panels, but they won't be done before I leave for TN. And of course, as soon as I get home we will be in final preparation for the fall craft fairs. Somewhere in all of that, the work on the house should happen, and the move out of the annex into alternate space is also supposed to happen. Maybe in January I can take a much needed break, although by then I will probably be scrambling to finish the book projects. Mary, discovering the joys of a computer assisted loom. And helping weave part of a panel for ANWG 2019. 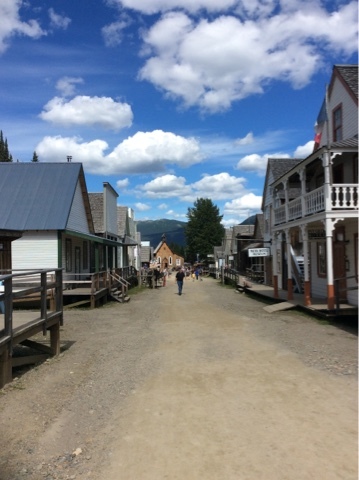 Today we went to Barkerville, BC for the day. It is a heritage site and shows how it looked (more or less) in the 1860's or so during the height of the Cariboo gold rush. That brown building at the end of the street is the church. The town was, at one point, the biggest in what was to become British Columbia. It also had the largest Chinatown north of San Francisco. 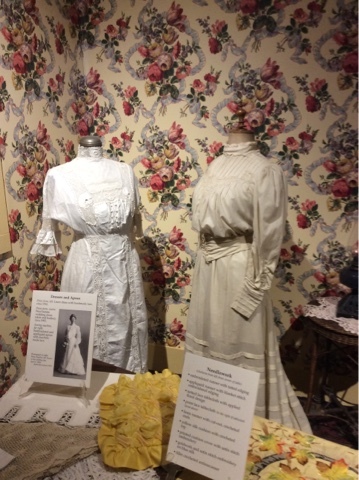 There were women living with their husbands (not just the ladies at the 'sporting club') and one of the displays was of clothing, both men's and women's. This wedding dress has machine made lace trimming both the bodice and the hem...yards of it. Maybe we should have gone panning for gold, after all! Allen Fannin (Handloom Weaving Technology) used to say that he liked boring because that meant nothing was going wrong. How right he was! So I am picking my way through this 100 yard long warp, hoping that the loom continues to behave (twice I've had to stop and fix 'issues' - when you add this much mechanical assistance, it seems something is always going out of adjustment or needing tweaking). But so far, so good. I've reached the 10% completion mark. These panels (come towels, eventually) are far from perfect. But their job isn't to be 'perfect' but to decorate the convention centre hall. They need to be colourful and even a bit dramatic. Inspired by the aurora borealis (northern lights) they will be bright and hopefully make the rather drab mostly concrete hall look warm and inviting. People often cringe at the thought of long warps. While it is true that longer warps pose some challenges, there are some very real benefits, too. For this project I am weaving panels, five yards long. Each panel will be the same, woven with the same colour rotation, in the same treadling. 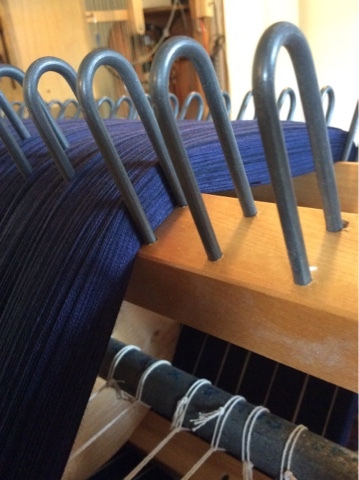 Warping the warp once means less time setting up the loom, less loom waste. It is therefore more economical in terms of yarn and time. Not to mention sitting cramped to thread...never a comfortable position. 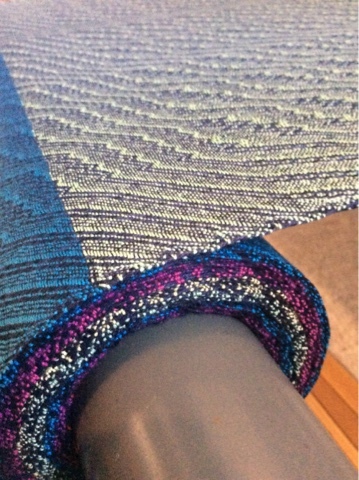 So, no, I don't mind dressing the loom with long warps. The frequent changes of colour (every yard) should keep things 'interesting' so that I don't get too tired of it. There will also be breaks while I am away, which should also keep it 'fresh'. Here are the five different wefts. 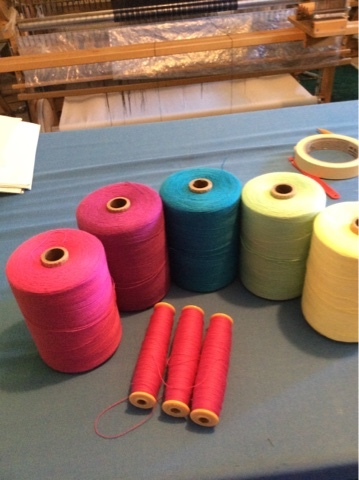 Each will be used in turn to weave a towel blank. Then the web will be cut into panels with the five colours in order. The panels will be used to promote and then decorate the conference facilities, then, on the last day will be cut into individual towels for sale. It may seem like starting now is much too early, but now is when I have a window of opportunity. Next year is shaping up to be hectic, so starting now is a Good Idea! 100 turns of the beam. 2/16 cotton, 32 epi. This warp is for 'panels' to promote and decorate the ANWG conference scheduled here in 2019. The conference theme is Confluences, and the colours are dark blue and some of the colours of the northern lights. The panels will magically transform into tea towel blanks to be sold as conference souvenirs. Or at least, that's the plan. Gotta have a plan, man! I have been working on Other Stuff the past couple of days. I needed a break, both physically and mentally, from weaving, mostly so I could work on the manuscript. (At 30,000 plus words and 130 plus pages, it now feels like a manuscript!). But my brain gets very mushy after several hours so I have also been knitting, and at guild drop in, spinning up more of my fibre stash to knit with. 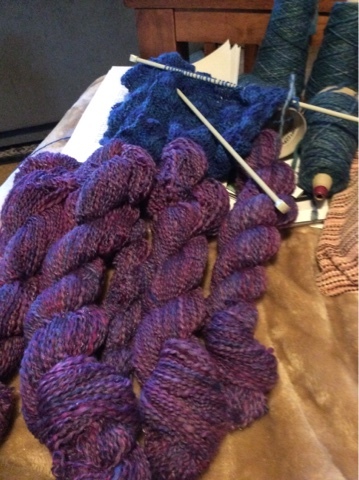 So, blue scarf on the needles, green/blue wet finished and coned, and tonight, finished plying the purple. I am trying to use up as much of the blue as I can, although that might make a pretty long scarf, I will see how long I make it. Currently reading Where I Belong by Alan Doyle.